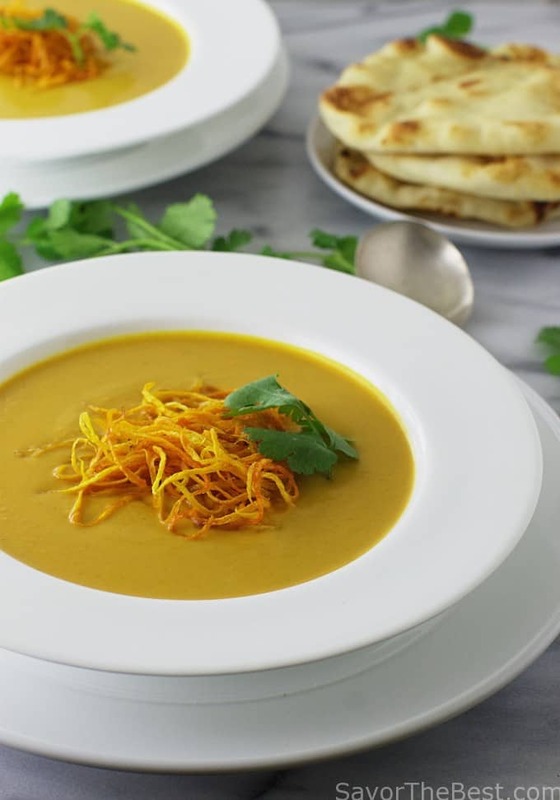 Enjoy a taste of India with this spicy roasted butternut curry soup and warm naan bread. 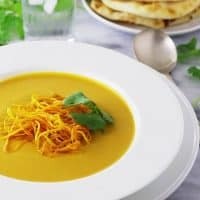 I love this thick, creamy, roasted butternut curry soup, it makes a delicious and satisfying meal with just a light salad and warm naan bread. Roasting the butternut squash in the oven brings out it’s sweetness and the slightly caramelized onions and garlic deepen the flavors. Coconut milk is used instead of heavy cream and the flavor compliments this soup nicely. We used the lighter version of coconut milk to eliminate some calories. The hot madras curry powder is a blend of many spices including a little red pepper so you may want to measure lightly and add it according to your taste preference. 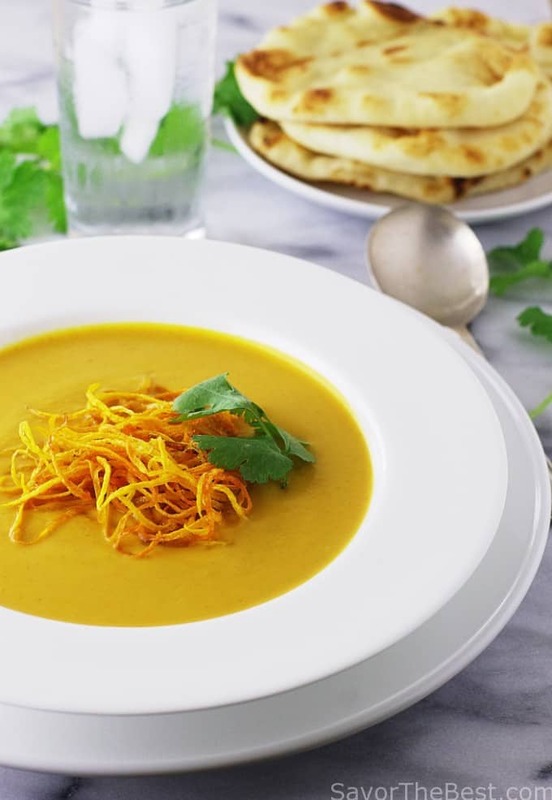 We topped this soup with a garnish of crispy butternut shreds made with a julienne peeler. The raw julienned shreds are dropped into hot oil and shaped into little stacks as they sizzle in the oil. A sprig of cilantro or parsley gives the soup a pretty touch. Crispy Butternut shreds for garnish! 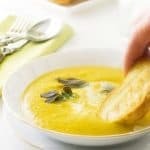 Have you made this butternut curry soup recipe? We would love to see a picture. Tag us on Instagram. 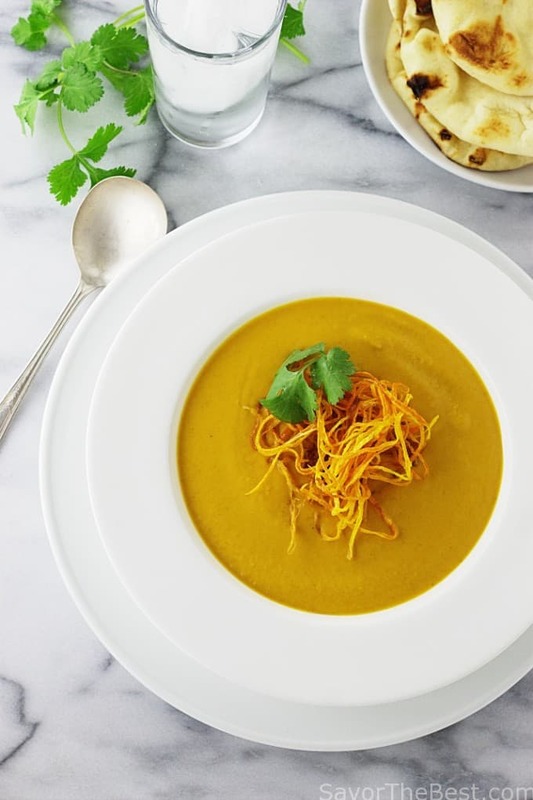 This roasted butternut curry soup is thick, spicy and creamy. Roasting the butternut squash in the oven brings out it’s sweetness and the slightly caramelized onions and garlic deepens the flavors. Cut the squash in half, scrape and remove the seeds. 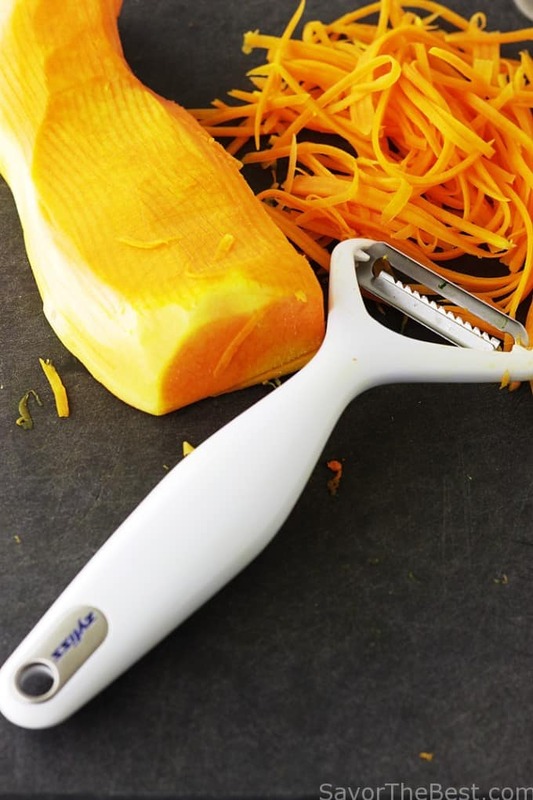 Using a vegetable peeler, remove the peel. Cut off a section and reserve to be used for the garnish. Cut the remaining squash into large chunks (2 or 3-inch size) and place on a baking sheet. Drizzle with 2 tablespoons of oil and transfer to the oven. Roast the squash for 30 minutes, until soft. Allow to cool on the baking sheet for 10 minutes. 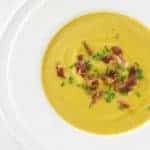 While the squash is roasting: In a large, deep soup pot or Dutch oven set over moderate heat, add the remaining 2 tablespoons of oil and when it is hot, add the onion, cook until lightly caramelized, stirring frequently. Add the garlic and cook just until fragrant. Add the roasted butternut chunks to the Dutch oven together with the chicken broth, coconut milk and cilantro then transfer to a blender. Working in batches, process the soup to a puree. Return soup to pot and reheat, add turmeric, cumin and the curry powder. Season soup with salt and pepper, to taste. Bring the soup to simmer, thinning soup with more broth if necessary. In a small skillet, set over medium-high heat, add the oil and when it is hot but not smoking, drop 1/4 of the butternut shreds into the hot oil and swirl them around with a fork. Remove them to a paper-towel lined plate to drain. Repeat with the remaining shreds, regulating the heat as necessary. Note: To test if the oil is hot enough, drop a couple shreds into the oil and if it sizzles and begins to shrivel it is ready. This looks fabulous – your pictures are gorgeous and I love the garnish! Yum, I love this kind of soup! Also, the fried shreds of squash are a really cool garnish! Squash and curry are just made for each other, aren’t they? Particularly in soup! 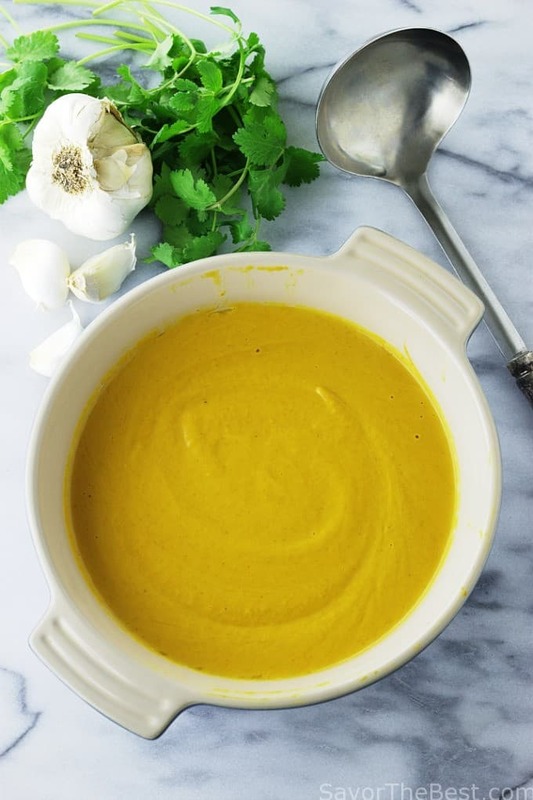 We’ve been having a lot of soup lately, so this recipe is so perfect for us. Thanks! And Happy New Year!